Recruiters have long leveraged technology such as ATS to do their jobs faster, easier, and better. The introduction of artificial intelligence for use in the recruiting process comes with promises of removing time-consuming employee activities that you now pay an actual person to execute and manage. But when you weigh A.I. recruiting tools against established local recruiters, which is the better investment for your most essential and hard-to-fill positions and projects? Active job seekers aren’t the worst thing, but there is a good chance that top level, employed candidates who are open to new opportunities and challenges are not applying online for jobs. They are not desperate to find work, so dealing with the whole A.I. recruiting process isn’t worth the time. The right recruiter knows who the top candidates are; they know the skill sets and personalities that match your unique culture and job requirements. Most importantly they know how to present such opportunities to the best people for the job. The promise of A.I. to improve the quality of hires relies on its need to use data to learn how to match the information provided by candidates on resumes and forms, to the requirements of the job and the intention of the job descriptions. But when A.I. 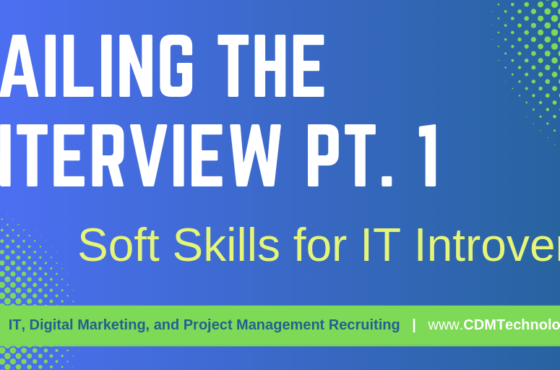 tools rely solely on the data that is supplied by the applicant and the search terms or keywords specified by the employer to perform correctly then fluffing a resume with the right words lets applicants trick the system. This can be especially challenging for hiring in the IT field where technical people understand how A.I. type recruiting tools work and will optimize their resumes accordingly. 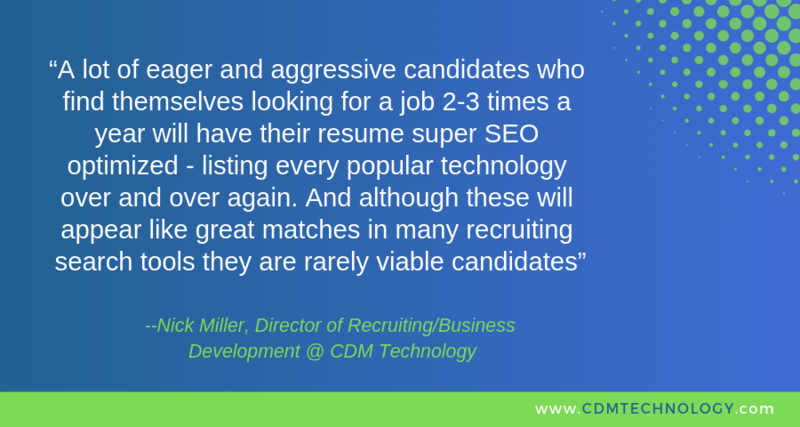 When you have an important position to fill or a project that requires a unique and well developed skill set, aligning yourself with a recruiter who will read between the lines when reviewing resumes and speaking to candidates is the difference between finding a candidate who knows how to optimize their resume with the right keywords, and finding the candidates who truly match your needs. From heavy hitters like ZipRecruiter to startups like Helena, A.I. is the primary tool for handling the many time-consuming activities of recruiting in order to “streamline” the candidate process. But while A.I. is obviously able to automate many of the recruiting and hiring functions, many candidates would argue that A.I. is far from “streamlining” the hiring process and in fact, is making it harder to get hired. Complaints of getting all the way through to the hiring process and even having video-based screening interviews without ever interacting with a person from the hiring organization or getting feedback are common grievances with candidates and a deterrent to attracting top talent. In June of 2018, ZipRecruiter proudly launched a feature called Candidate Calibration which allowed employers to rate potential matches for a job and for each applicant they rated positively that job posting is sent to similar candidates in their database of 10 million monthly users. While that one, initial candidate will never be notified that an employer positively rated their profile, there are thousands of ZipRecruiter users with similar words in their profiles who are bombarded by job posting emails for a job they never posed interest in just because their profile held some similarity to someone who matched a position ZipRecruiter has to fill. Can you truly hire the best candidates when top talent doesn’t feel the need to jump through the A.I. hoops to get their information in front of the person making hiring decisions? Recruiter chatbots are designed to provide real-time interaction for candidates by asking questions based on the job requirements while providing updates and suggestions on what next step the candidate should take. This “pre-screening” or “pre-interview” process being one more task A.I. promises to do to save time by giving candidates a chatbot. But where is the “chat” in replying to job requirement questions and being unable to get answers to any questions the candidate may have? Many companies use A.I. in some form to accomplish parts of the recruiting process, and large businesses needing to fill hundreds of unskilled and non-technical positions should take advantage of the time and money saved. However, with automated email sequences and one-sided chatbot “conversations,” A.I. recruiting systems lack the personal touch that is needed to woo top talent. An experienced local recruiter has the network, connections, and skills to find and manage the best candidates for your needs when you need to make an important hire. 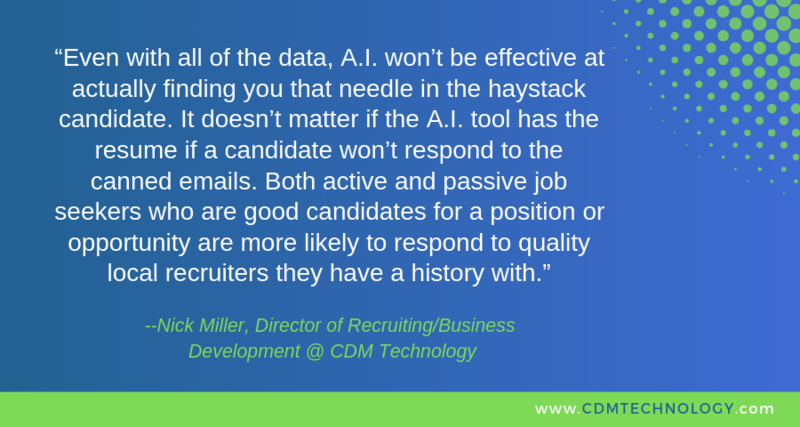 This includes candidates who are not even applying for jobs, so they aren’t responding to cold emails or taking the time to talk with chatbots. There are of course people who prefer to avoid all human interaction and use chatbots for everything from online customer service to ordering their next fast food meal, but an inability to effectively and professionally conduct themselves with other humans may be a significant indicator of how well they will perform in many jobs. Investing in A.I. for recruiting may seem like a cost-saving solution, but the cost of a bad hire is a huge financial risk at a time when companies should be focused on spending their money wisely to find and hire those hard to find candidates. With the right recruiter you’re selecting from well-established people in the marketplace who have both a proven good track record with their clients, and a long history in the city they are working in. The best recruiters have eyes and ears in the marketplace, both locally and nationwide. With a recruiter who is an expert in your industry you know you are partnering with a dedicated person throughout the whole recruiting, interviewing, hiring, and onboarding process to ensure a successful hire is made. And while A.I. can take over some of the more tedious repetitive tasks, human input and oversight are still required. Using A.I. doesn’t eliminate the need to pay actual people to run the recruiting functions and may actually cost you more when you need to hire someone qualified to quality check, maintain, and troubleshoot complex A.I. systems. While A.I. is busy learning to mimic human decision making, real-life recruiters are in the trenches every day absorbing what is happening in the employment marketplace and your industry in particular. They see what top talent is doing and they know what your competitors are offering. 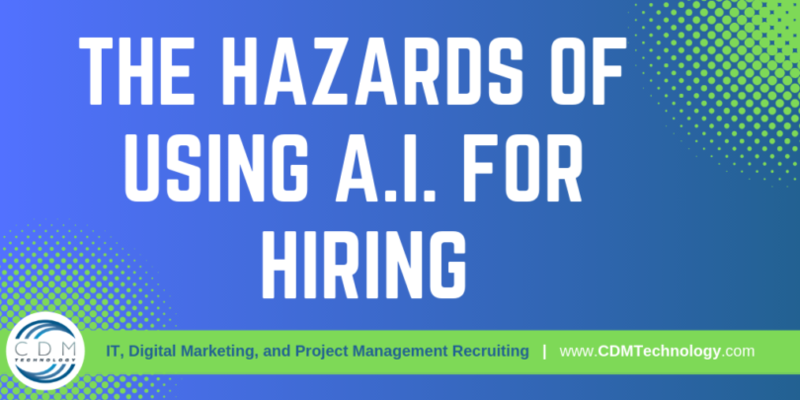 Make the right hire by avoiding the hazards of A.I. and working with an established local recruiter who has the information you need to edge out competitors for top talent. Chip Murphy is a co-founder of CDM Technology and has over 19 years in the IT consulting, contracting, and professional search service space. CDM Technology is a customer-focused, premier provider of consulting, contracting and recruiting solutions for the IT, Digital Marketing, and Project Management markets. Each company’s hiring situations is unique – that’s why our use of personalized hiring solutions and a team-based approach take advantage of opportunities that your competitors can’t. With over 30 years combined experience in the San Diego IT market and a broad network of top clients and candidates, when you tell us what you need, we put the right type of resource in front of you.